This weekend, April 15th-16th, San Diego will be hosting part of the 2017 Red Bull Air Race! Fourteen pilots from around the world will be competing in a high-speed obstacle course over the bay! San Diego is the second of eight stops in this year’s World Championship. Between races, there will be lots to see. Paragliding, wing suit jumpers, helicopters, and activities for event attendees. A MUST SEE for adrenaline junkies! Red Bull began as an energy drink and is now a billion dollar brand associated with extreme sports. Red Bull owns 7 sports teams, sponsors many extreme athletes, and hosts 3 of their own major events: Red Bull Cliff Diving World Series, Red Bull Air Race, and Red Bull Crashed Ice. The first official Red Bull Air Race World Series was hosted in 2003, “devised by a Red Bull sports think-tank” just the year prior (source). The event quickly gained popularity among pilots and sports fans alike. The air race is an annual competition. There was a three-year hiatus after 2010 to update the rules, regulations, and put more of an emphasis on pilot skill. San Diego hosted the 2009 Air Race with French pilot, Nicolas Ivanoff, taking first place. Will he reclaim the title this year? Pilots fly two laps through the giant, inflatable pylon gates. They are to fly perfectly level through the pairs of two, and bank at a 90° angle around the single cones. These Air Gates are designed to withstand the wind, but burst immediately if touched by an aircraft. Each pylon has six sections, so if it is popped, that section can be easily replaced. Contestants are ranked by their race times. There are time penalties for hitting a gate, flying too high over one, or not passing a gate at the proper angle. Joining the pilots in the sky, professional athletes will be soaring on their water-powered jet boards. There will be three scheduled demonstrations over the weekend. One on Saturday, and two on Sunday. Times are available on the schedule below. We are very excited to have this sport incorporated into such a large event. Where You Can Try It! Aquatic Aviation is located in Point Loma, San Diego. 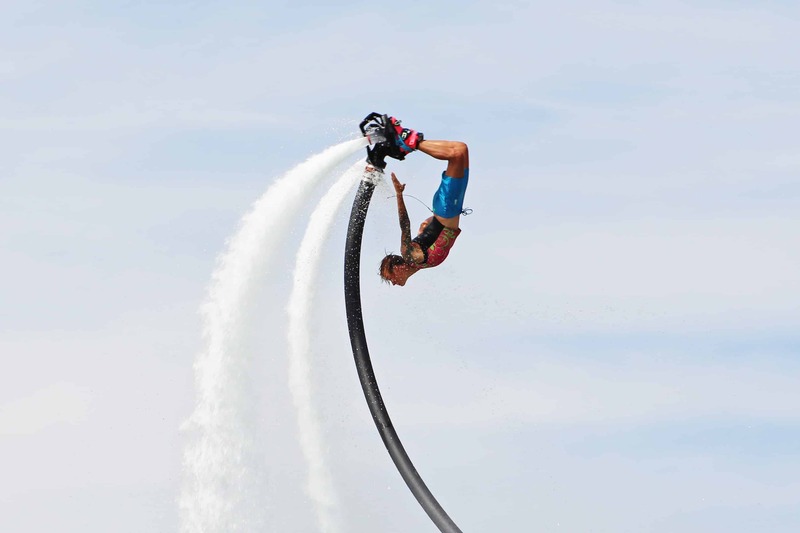 This weekend, in celebration of the Air Race, we will be offering 30% OFF our most popular Flyboard lessons. Our lessons include 10 minutes of on-land training and then most people get their balance on the board within 5-7 minutes! Use code REDBULL at checkout to get your discount. Schedule your next flyboard lesson on our Book a Lesson page or pick up a gift certificate in our Online Store. The racetrack will be in the bay across from the convention center. Spectators can watch from the Embarcadero Marina. Tickets will be available on both the north and south sides of the park. Tickets can be bought in advance online or the day of at the event.